A murder inquiry has started after a man died close to a community hospital. 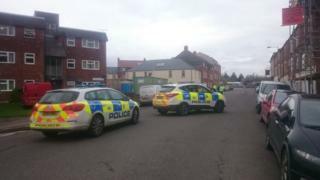 Wiltshire Police said the death happened after a fight in which two men were attacked in the early hours of Sunday near the Trowbridge Community Hospital. The force said officers were still dealing with the situation. Detectives said they were called by the ambulance service at about 01:45 GMT and the victim was in his 20s and local to the town.